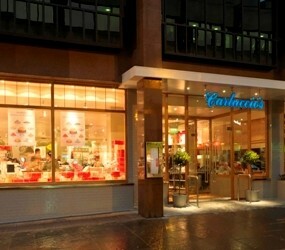 CHRISTMAS has come early this year as Carluccio’s opens its first restaurant based in Scotland in the cultural and vibrant city of Glasgow. Bringing its much-loved combination of a genuine Italian restaurant, food shop and delicatessen, Carluccio’s welcomes shoppers and diners throughout the day and is set to become a celebrated addition to the city’s bustling commercial district. Passers-by will find it hard to resist tiers of fresh food displays and beautifully decorated shelves visible from the deli and food shop window. A sweeping marble bar provides the perfect spot for a post work drink or pre-dinner aperitivo with antipasti. Further inside, an inviting restaurant awaits where diners can enjoy a delicious Italian meal with everything from handmade pasta, seasonal fish, meat and vegetarian dishes as well as decadent desserts, many based on Antonio Carluccio’s original recipes. Two courses paired with a glass of something fruity will set you back as little as £15, offering good food at sensible prices. Carluccio’s community tables are the perfect spot for an early meeting with friends or colleagues. Pair a coffee and fresh juice with hearty breakfast options including scrambled eggs, grilled pancetta, sautéed mushrooms, tomato and toasted ciabatta – the Colazione Magnifica for £6.95. In a rush? Pick up a Carluccio’s coffee to go and choose from two exclusively roasted blends – the robust Neapolitan or the smoother Milano – ideal for that early morning boost before work. Whether looking for a quick bite and a bellini with a friend, or a relaxed, leisurely Sunday lunch with the family; Carluccio’s offers a genuine Italian tasting experience. Primi courses include classic dishes such as Pate de Fegatini – smooth chicken liver pâté, toasted Tuscan bread and cornichons (£5.75). Whilst freshly prepared Italian pasta dishes are celebrated (Spaghetti alle Vongole in Bianco, Neapolitan spaghetti with whole fresh clams, garlic, herbs and chilli for £11.95), there are also Secondi dishes to discover including Osso Bucco alla Milanese – slow cooked shin of veal in tomato sauce with a creamy saffron risotto (£15.95). For a little piece of Italy at home, Carluccio’s food shop is bursting all year round with fantastic fresh food, store cupboard items and gifts sourced from artisanal family producers. Just in time for the festive season, shoppers will discover beautifully wrapped foodie products such as traditional panettone, chocolate covered figs presented in a handmade basket as well as the finest olive oils and carefully put together gift sets – making Christmas shopping a pleasure. As well as this, Carluccio’s deli counter displays an abundance of cheeses, olives and parma ham as well as tarts, sandwiches and desserts ideal for lunches on the go and take home suppers. To celebrate its recent opening, from 6pm on Thursday 1st December and Thursday 8th December savvy, seasonal bargain hunters can shop’ til they drop at Carluccio’s Christmas shopping evenings and take advantage of a ten per cent discount on the entire Christmas range. Guests will step out of the cold and into a foodie treasure trove of seasonal treats, where they can enjoy complimentary Piccoli Assagi (festive canapés) and warming glasses of Vino Cotto (traditional mulled wine) whilst perusing shelves stacked with ornately wrapped, regional Italian products and culinary gifts. To complete the Italian Christmas experience, celebrate with friends, family and loved ones over a well deserved, festive feast. Carluccio’s have developed Il Menu Di Natale 2011 with three specially tailored courses for just £20 per person. Typical dishes include Antipasto delle Festività, with burrata, Sicilian aubergine stew, and cured meats and Saltimbocca Di Pollo – chicken breast wrapped in parma ham with sage, served with rosemary and garlic potatoes. Round off this sumptuous spread with a Selezione di Dolci di Natale – a selection of mini dishes including blackberry tart and profiteroles.